I have been plodding away at a BT Hurricane for nearly a year and I need a bit of a break. As Tony has just released the latest latest incarnation of his popular Spitfire I thought it would be great to put one together for electric power. I think I will have to shave a little weight of this airframe as I want a bit longer than my normal 6 minute flight time, will want to up the A123 cell count to 15 - 18. it may still end up at 15lbs but hopefully no heavier as that is my fields limit. I will be using Fighteraces epoxy resin and glass, for those want to see how to use it, and Warbird colours again from Phil at Fighteraces. but I am still thinking about that. Hey....I'll be watching with interest Danny. I'm just about to start a Top Flite Sea Fury so will be interested in how the glassing is done as I think I'll use that on the SF but have never tried it. Second Danny on the Fighter Aces resin. Have never glassed before with a proper epoxy resin but have been useing the fighter aces stuff on my Halifax. Can confirm it goes on brilliant. Super stuff. Give it a go you will be amazed with the results. As long as you follow Phil Clarkes accompanying instructions/glassing guide (pdf download from his site) to the letter you will have absoloutely no problems. The resin Phil sells is nice, it dries with no waxiness and is a joy to sand. There are some tricks to putting it on and you wouldn't believe how little you use. I am no expert by any means but got pretty good results fairly quickly. You will need some scales that read to the gram though. Plenty on EBay for around a tenner. I am also going to do some raised panel edges using electrical tape and filler, plus vinyl chart tape and hi build primer to show panel lines for those that want to see how that is done. Again I am no expert but should be able to let everybody see enough so that you can have a go. This is a great subject to practice these skills on. I have contacted Tony at Unitracts regarding the cost for the retracts and he has comeback with £110 for mechanicals and £215 for air driven (plus postage) I am going to go with mechanicals because I have a big meaty servo lying around, and because I have had no trouble with my Seagull Fury on mechanicals. I have been studying the plan this evening and I think there are several areas for losing some weight. In fairness to Tony he did indeed say this during the You Tube interview. There is a great deal of thick wood used, which I may try and reduce. And also with careful cell position, and some weight saving on the tail I will try and remove that 1.5lb of nose weight. A huge amount will depend on the quality of wood provided. If it is dense then the weight will shoot up. The beauty of A123 is that you can more or less build them into the airframe, so no hatches and you can wedge them right at the very front, directly behind the motor. The electric motor also concentrates the mass much further forward than an IC so that also helps. "I see. So I tell the cabinet, that you're trusting in radar and praying to God, is that right?" well worth doing. It'll make a change from military colours. Slightly off topic temporarily - how do A123 cells perform in the cold? I will be joining you soon. My bench will be cleared today. The retracts have been ordered from Unitracts (air) although they cant deliver until november. I intend to do a MkV, maybe the Al Deere one from 1941. I have all the wood etc so I am really looking forward to this one. My only comment Danny is DON'T build the clipped wing version...its 'orrible!!! 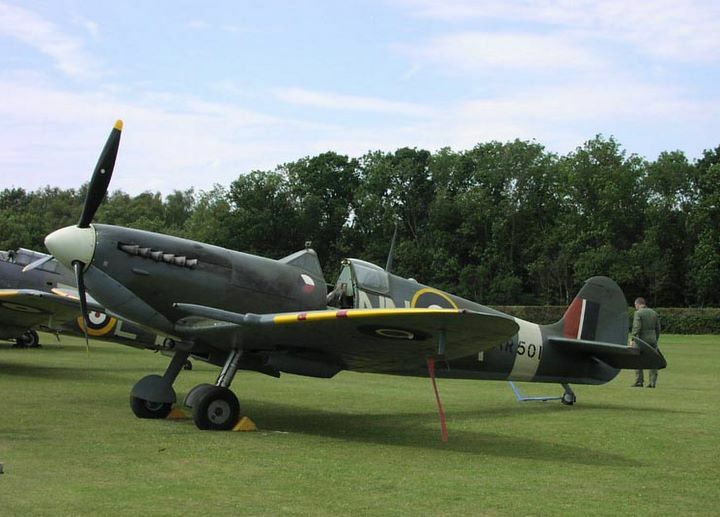 A Spitfire has elliptical wings.........end of story!!! Might put mine on floats! Nice one Danny. I'm keeping a close eye on this one. Good luck. I still cant make my mind up, i'm about 4 models behind everyone else when it comes to TN models! Arghh. I still want to do the hurricane. I like the prototype, I always thought it was silver, but apparently a presentation model was built in 1936 using the same blue paint as the full size. That paint was used to match the replica in the photo. Anybody got any walkaround photos? Hi Steve, I must be odd, I really like the clipped wing variant. Not as beautiful as the std wing but kind of brutish in a Fury sort of way and different. Not as ugly as the extended wing tip variant. Hi Iain, good to have you watching. This is my first TN design so its never too late. Get on the blower and get some bits ordered, plenty of time to join in. Maybe we can all meet up at an event next year and get them up together. Shut up! Silence - in Polish! Well, much as I love the profile of the Eliptical wing, there is something about the Clipped wing... Something... Tough and functional. K5054 had three different paint jobs to my knowledge. It maidened in an aluminium and primer finish and then was very soon after painted Duck Egg blue. It then had the "A" camo scheme for public consumption. You have me thinking now... I might have to build my 62" Mk IX as an LF V with clipped wings. Hi Hugh thanks for the background on K5054, that explains a lot I must confess I am not as well up on the Spitfire as I am on the Hurricane. The *engine's* overheating, and so am *I*! Either we stand down, or *blow up*! Now *which* do you want? Hi Danny, I always thought of the prototype colour as "airfix spitfire blue" and wondered why they used that colour plastic!. Never let me catch you doing a victory roll over my airfield again. Understood? How many time have I told you - never fly straight and level for more than 30 seconds in a combat area! "We must find more pilots or lose....."
Somehow I think a spit just has to be Green/Brown or Green/Grey, don't you think? Here's AR501, this time with wing tips restored. Many years ago a friend of mine did PR Spit from the Mick Reeves kit, his was in pastel pink, the rivet detail etc showed up really well, but somehow it didn't look right to me. The PR blue is nice though. At the moment I am drawn to a mud and grass clipped wing...... Sorry Steve..... But I can't find one. They are all grey and green. Detachable tips ? Problem solved !